WHAT HAPPENED: This time last year, American Bethanie Mattek-Sands found herself hobbling around on crutches after a horrific knee injury at Wimbledon. 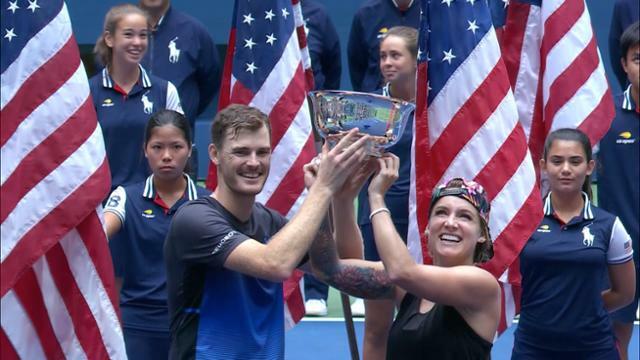 Saturday, she leapt for joy into the arms of her new partner, Jamie Murray, after capturing the 2018 US Open mixed doubles title, 2-6, 6-3 [11-9], over Alicja Rosolska and Nikola Mektic. The inspirational performance marked Mattek-Sands’ first title since returning from injury, as well as her first tournament playing with Murray. The key to their success? “Pick the best partner,” Murray joked. “I got a good talent for that, I guess. We had an amazing two weeks.” he said. During the trophy ceremony, it was cause for festivities all around as Murray coaxed the Arthur Ashe Stadium crowd into a singing “Happy Birthday” to his mother, Judy Murray, in the stands. Mektic and Rosolska both made their Grand Slam final debuts against opponents with vast experience but came out calm. The duo started out dominating on serve, winning six-for-six first-serve points during their first two service games. Across the net, the reigning mixed doubles gold medalists found trouble early on serve, with a backhand crosscourt winner from Mektic creating a break opportunity. The deciding point went the way of the newcomers, as Mattek-Sands’ lob attempt sailed long. Trailing 2-4, Mattek-Sands and Murray saved two break points, only to find the net on the deciding point. Rosolska served out the set under duress, with a Mattek-Sands challenge saving set point and forcing a deciding point. On one of the duo’s 13 winners, a Mektic smash emphatically earned the set at 6-2. The second set saw Murray and Mattek-Sands settle into a rhythm, winning 93 percent of first-serve points, compared to just 54 percent in the first set. Neither team faced a break point to 3-3. On Rosolska’s serve, a too-hot-to-handle forehand from the American saw Mektic merely put his racquet up in defense, only to catch the net and lose the break point, giving Murray and Mattek-Sands a 5-3 lead. Serving out the set was not a simple task for Murray, who was forced to hit a mind-bending crosscourt forehand winner that caught the line on the deciding point and capped off a four-game run for 6-3. In a tension-filled match tiebreak, Mektic and Rosolska earned the mini-break at 2-1 on a forehand error from Mattek. With Mektic and Rosolska holding onto the 4-2 edge on the change, Murray and Mattek-Sands took over. The duo caught fire with a tremendous pickup lob from Mattek-Sands for 4-4, combined with a blazing backhand return from Murray for 5-4. The duo stretched the lead to 9-6, but the opposition would not go down without a fight. Murray held the match on his racquet, serving at 9-8, and moved in only to bury a backhand into the net, 9-9. The squandered opportunity did not haunt the major champions, as it was Murray who ultimately found the dagger in the form of a left-handed forehand shot to end the match, 11-9. The team was six-for-six on first-serve points in the decider. SEE ALSO: Scotland's Jamie Murray wins a title at the US Open for the third straight year. WHAT IT MEANS: Mattek-Sands finds herself once again at the pinnacle of the sport after a long, grueling road back from injury. She also earned a shot at mixed doubles redemption and capitalized: the Minnesota native lost the title match in 2015, playing with fellow American Sam Querrey. Mattek-Sands adds an eighth career Grand Slam title to her shelf, marking her third in mixed doubles. Murray is loving his time in New York. In his last three appearances in Flushing Meadows he walked away with three titles. The Scot successfully defended the mixed doubles title he won last year with Martina Hingis. He also stood atop the mountain with Bruno Soares in the 2016 men's doubles championship. MATCH POINT: The trophy puts 33-year-old Mattek-Sands just one Wimbledon title away from a career Slam. Murray is now the seventh man in the Open Era to win the US Open mixed doubles title with more than one partner.